NOTE: Before purchasing, check with your instructor to ensure you select the correct ISBN. Several versions of Pearson’s MyLab & Mastering products exist for each title, and registrations are not transferable. To register for and use Pearson’s MyLab & Mastering products, youwill also need a Course ID, which your instructor will provide. Accurate, readable, and up-to-date, Contemporary Maternal-Newborn Nursing presents pregnancy and childbirth as normal life processes with family members as co-participants in care. 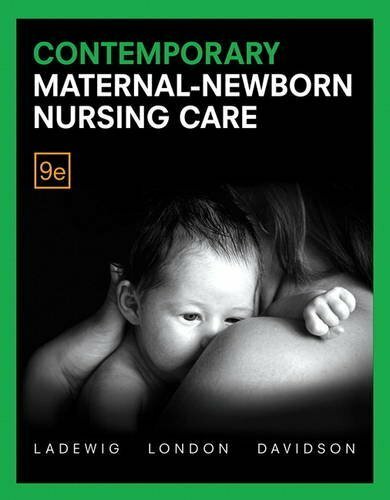 This text thoroughly illuminates all aspects of maternal-newborn nursing and many opportunities for nurses to make a difference in a changing healthcare environment. After introducing key concepts, it progresses through the steps of the nursing process, clearly delineating nurses’ roles throughout pregnancy, labor, birth, the newborn period, and postpartum care. For each, it presents basic theory followed by chapters on assessment and care for essentially healthy women or infants, and then by complications and treatment. Recurring themes include evidence-based practice, critical thinking, clinical decision-making, community-based care, patient and family teaching, safety, cultural competence, complementary/alternative therapies, and health promotion. This edition’s significant updates include revisions reflecting the latest recommendations of AACN Baccalaureate Essentials, QSEN, the Institute of Medicine (IOM), and Healthy People 2020.